The AFI aka American Film Institute is a rich and storied institution that provides a fantastic look at the American film industry. One of the best things about their site is the many top 10 and top 100 lists available for the true film fans. 1. It’s A Wonderful Life: Is anyone better than Jimmy Stewart for gratitude? 2. To Kill A Mockingbird: A curious choice due to it’s serious subject matter but brilliant none the less. 4. Rocky: Awesome period piece with a message that never gets old: believe and overcome. 6. E.T. The Extra-Terrestrial: Family fun and a reminder we can love no matter the form. 9. Miracle on 34th Street: Fantastic Santa story for the little ones and the big ones too! 2. The Shawshank Redemption: In my all time top 3 movies and most likely the greatest acting effort by Morgan Freeman. 3. Field of Dreams: This one’s for my dad who I love very much and the American dream fathers and sons share from generation to generation. Twitter.com is fast becoming the go-to source for small and big business marketing. For me, Twitter represents my greatest content resource, broadcasting opportunity, and a fantastic networking opportunity with industry leaders. One of those leaders, Guy Kawasaki, dropped a “tweet”, aka mini message, about the power of Twitter in growing your business. On November 24, 2008, at 3:56 PM, j2xl wrote: I work at Amazon. During a lunch break last March I wrote a simple bot that posts Amazon’s deal of the day to Twitter. Since then I’ve added Lightning Deals throughout the day. The bot now has close to 3,000 bargain-hunting followers and drives all sorts of orders every day. Add it to the list of Twitter success stories. Check it out at http://twitter.com/amazondeals . Big corporations like Amazon, small firms like Innerarchitect.com, and entrepreneurs like Adam Helweh of Secret Sushi Creative are building their businesses, creating opportunities, and connecting with industry leaders on Twitter. The next time you are looking for a method and strategy to increase your business, make new connections, find opportunities, look for a job, or broadcast news about you–look no further than Twitter.com. It is your “mini PR release-sound bite broadcasting” tool. Courtesy thedomesticdiva.wordpress.com daughter Marielle desperately needs your help! Marielle is being transfered to a new and better hospital NY Presbyterian-Columbia University Hospital (NYP) in hopes their additional living-donor kidney programs will save her life. Please consider the following kidney donor options if you or somebody you know can help Marielle. How do bloggers measure their writing, article effectiveness, viral marketing power, and popularity with readers? Comments from readers and blog traffic can only provide a margin of insight into your effectiveness. Clive Thompson’s great New York Times article “If You Liked This, Your Sure to Love That” describes an interesting contest hosted by online movie rental company Netflix. Netflix is offering anyone the opportunity to win a $1,000,000 prize. The challenge is to increase Netflix’s Cinematch it’s recommendation search engine. The engine suggests movie titles to consumers based on what they have chosen in the past. Netflix will pay out the cash prize to anyone who can increase their search accuracy by 10%. The leaders in this contest and their progress. Statistical analysis and algorithms do not account for a genre of movies that have been described as quirky or unpredictable. The effect is called the “Napoleon Dynamite Problem” because it is said that this type of movie is either loved or hated by it’s viewers. Very little middle ground exists or gray area of preference. 2. If that can be done, the next step would be to ask readers to provide 3-5 adjectives that describe the blog article they just read. 1. If a blog reader likes one article what other articles in your blog library would they enjoy? Thanks go to Vijay Krishna who alerted me to this information on Twitter.com: a fantastic social media site that provides 80% of my research data. You can find solid information by following Vijay on Twitter . Thanks also go to New York Times writer Clive Thompson for his insightful and wonderful piece on this challenge. Thank you Clive! 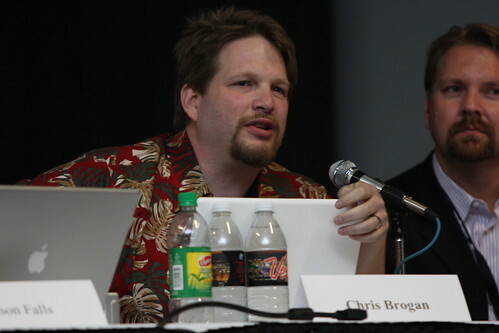 Chris Brogan’s Two Tips To Public Speaking: What’s In It For Me? Courtesy of (CC) Brian Solis, www.briansolis.com and bub.blicio.us. Chris Brogan, one of this generation’s true social media superstars states: WIIFM aka “What Is In It For Me?” Before you can understand how to provide the audience with the answer to WIIFM, let’s examine one of the most common mistakes speakers make–me included. Analysis: Often times I rely upon building my credentials first before getting to WIIFM. Do you find yourself moving your own value message forward before connecting with the audience’s need to CARE about your message? Benefits: By asking this type of question, you are relating to the audience’s need to care and understand what is in it for me. “This means start by making sure your audience (especially if they’re skeptics) knows that you’re on their side. The Takeaways you provide should be “very actionable.” When I finished my workshop on Blogging to Employment, I gave my audience a homework assignment that included research, writing their initial blog article, and formulation of a target list. Benefit of Takeaways Keeps You Connected: you remain connected and have a solid reason to collaborate with your audience as a resource and coach for their next step actionable items. Organizational Structure: people need and want structure and organization. By giving Takeaways and “homework” you are helping your audience to be more organized in their quest for new information and solutions.